The ÖBB Nahverkehrs-Doppelstockwagen (commuter double-deck cars) are a double-decker commuter carriages were built in 1995 and are the backbone of transport in the eastern region of Austria. The province of Lower Austria decided to provide the ÖBB with financial support for the purchase of the first series of double-carriages. In return all vehicles of this series were equipped with a “weasel” logo. While I found a dog on the side of a train south of Moscow, Russia. 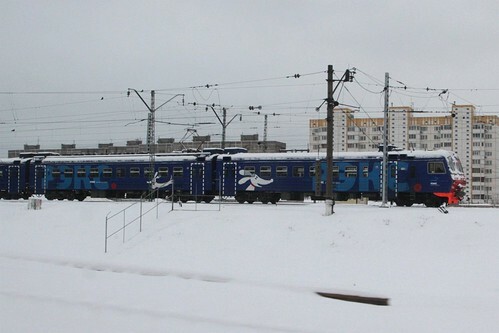 «рэкс» (REX: Region Express) is a company operating commuter express trains in the Moscow Region, established by the Central Suburban Passenger Company and Aeroexpress in 2011. 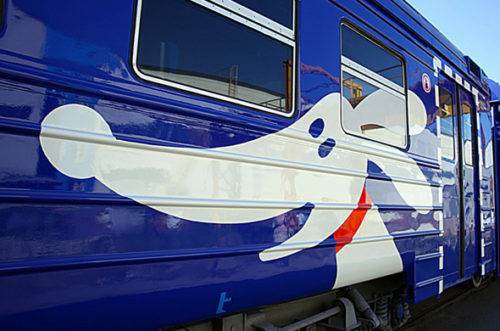 The high-speed trains had a logo – a dog, as well as a corporate colour – blue. According to the designers, a new visual solution will allow the brand to break away from the stereotype of “green elektrichka” (electric trains). This entry was posted in Trains and tagged Austria, branding, dog, Moscow, Russia, Vienna, weasel. Bookmark the permalink.